Of all the comments and mutterings that readers post about my reviews, I think the most common is a shocked response to the cost. That kind of thing, although perhaps with a more generous use of the CAPS LOCK key. Well, never let it be said that this flash idiot doesn’t respond to his critics. And they do have a point: a quick check back through some of my most recent reviews (and those to come – brace yourselves for maximum fury next week) reveals a dearth of anything you could possibly describe as a real bargain. 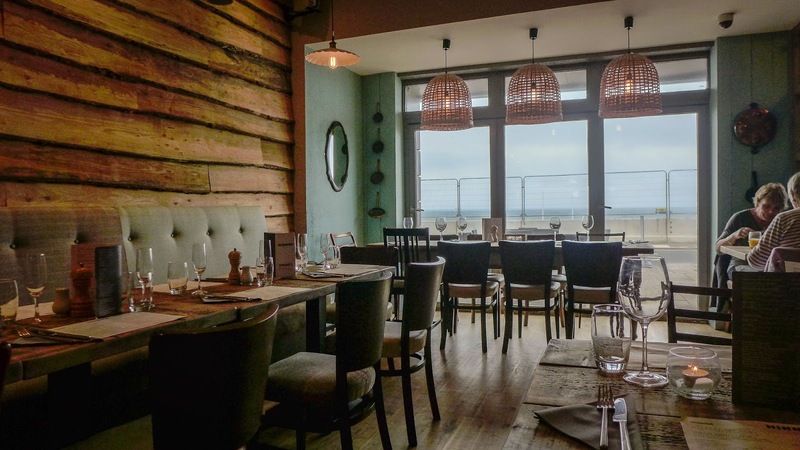 Just as I resolved to remedy this, the early evening menu for Hinnies in Whitley Bay popped up on my Twitter feed: £15 for 3 courses. Serendipity. 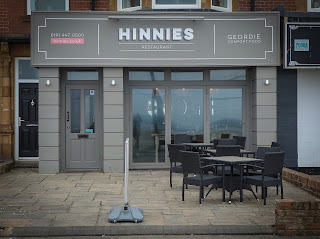 I had been meaning to try Hinnies ever since it opened earlier this year, but had been slightly cautious on a couple of counts. First, it’s the sister of Blackfriars in Newcastle, which earned only 1 star when I visited back in 2011. I didn’t really want to bestow a second wooden spoon on Andy Hook, who owns both places. Second, the promise of an “earthy Geordie-influenced” menu had me half expecting to walk into a room decked out in all those wooden signs I hate in gift shops. Don’t get me wrong, I’m as proud as anyone to hail from these parts, but that doesn’t mean I want a notice on my lavatory door pronouncing it to be “wor netty!”, or a list of “Geet canny” Geordie sayings etched in cheap wood in my dining room. 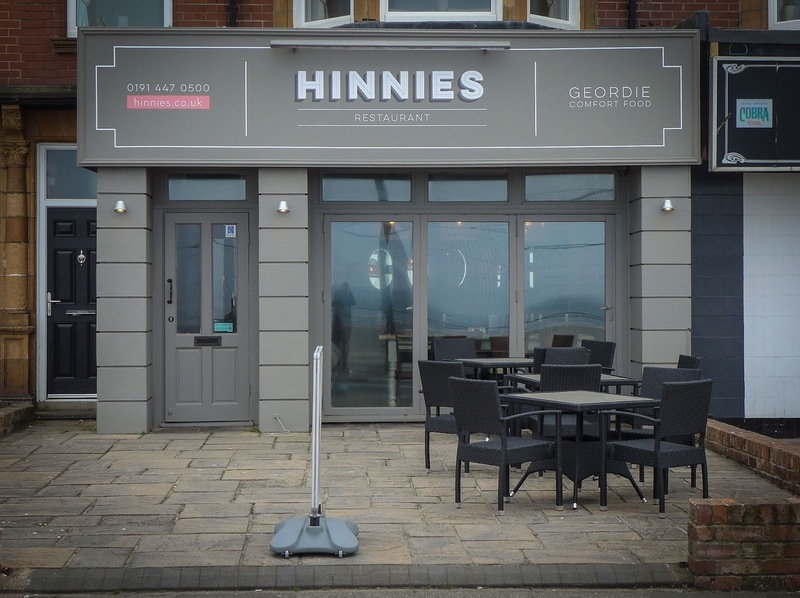 Hinnies, set right on the seafront, already proclaims “Geordie comfort food” on its sign outside, so I half expected an avalanche of kitch. Instead I found a really pleasant, modern room, with soft chalky-green walls, untreated wood and grey fabric banquettes. Sure, someone has raided ye olde cooke shop for the copper pans, jelly moulds and the like, which were scattered about the place, but that was as chintzy as it got. 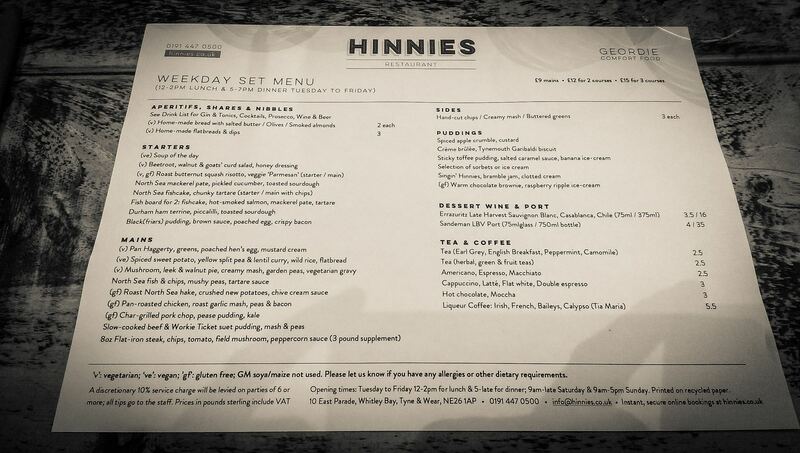 Best of all, I found Hinnies’ Geordie comfort food very comfortable indeed. The trick in producing a successful “early bird” or set lunch menu comes from coaxing good flavour from cheaper ingredients by employing solid technique. Our starters were a fine demonstration of this art. 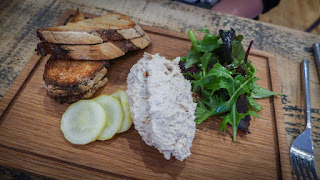 Mrs Diner’s mackerel pâté was smoky but light, having been whipped up with some form of dairy, and perfectly seasoned. 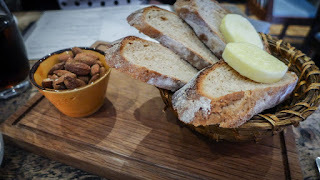 There was heaps of it too, which we greedily mounded onto very good sourdough toast. Pickled cucumber provided crunchy and acidic counterpoint. My starter of black pudding was not quite so hearty, but no less delicious. 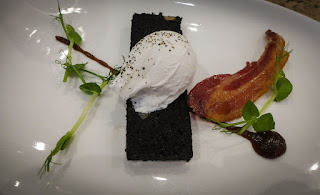 The main event had a nice crisp crust and was adorned by a perfectly cooked poached egg. 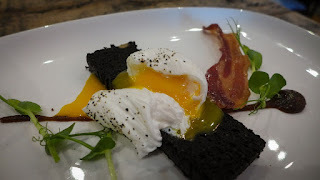 I love a good poached egg: you can stick one on just about anything to good effect. Tangy, fruity brown sauce rounded out as good an all-day breakfast as I’ve had in a long time. 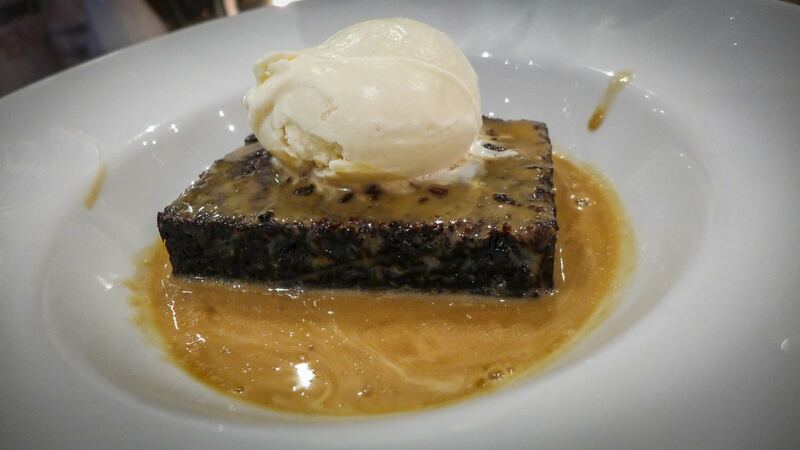 The chance to order pudding as a main course is not one to pass up lightly. This was a suet pudding which, when sliced open, spilled its guts of good quality braising beef and Workie Ticket gravy all over the plate. The suet pastry was just as you would hope. 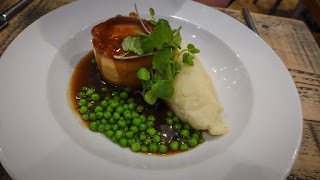 In one bite I was transported back to my Mum’s version of suet pudding, decades ago. “Christ, this is really good…,” I may have murmured. 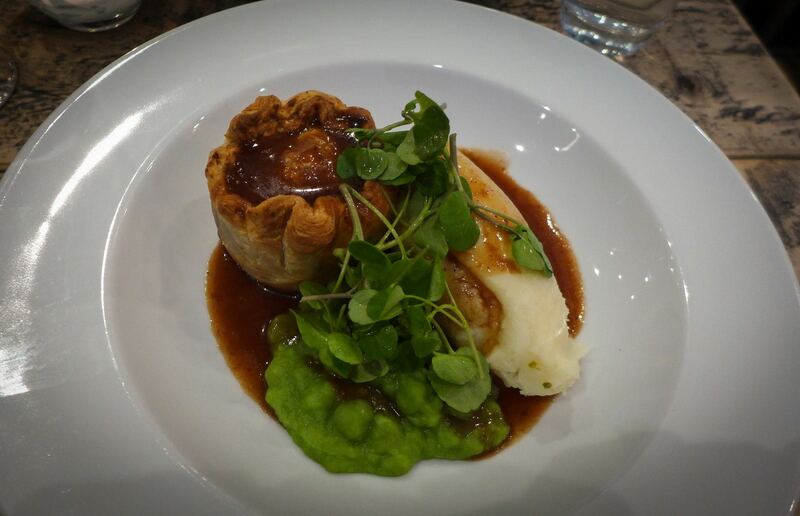 Mrs Diner had also plumped for pie, hers a slightly lighter and altogether vegetarian rendition involving mushrooms, leeks and walnuts. The former dominated, full of earthy flavour, while the nuts added textural contrast. Our actual puddings brought no let up in the quality. 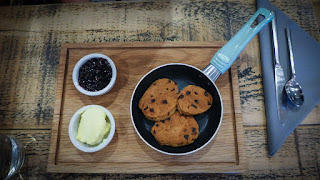 We had to sample the traditional griddle cakes from which the restaurant has taken its name and I’m happy to report that their Singin’ Hinnies, though a touch on the floury side, tasted great, helped no end by the inclusion of animal-based shortening. Humming alongside them were a backing duo of fine bramble jam and clotted cream. Also, as many of you know, I am a hopeless sucker for a sticky toffee pudding. The one served here justifies its calorific count: light sponge, a generous moat of sauce and a scoop of delicious banana ice cream. What else? 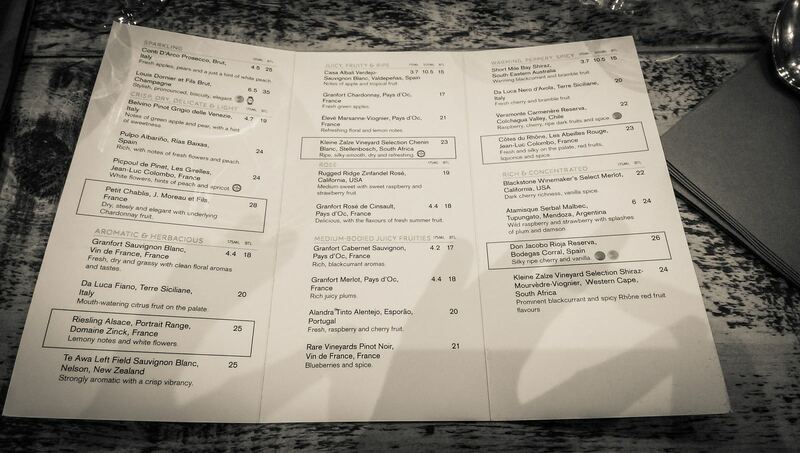 The intelligent and international wine list carries four each of red and white by the glass. The Argentinian Atamisque Serbal Malbec went very nicely with my steak pudding. A small glass of Errazuriz late harvest Sauvignon from Chile was a honey-sweet way to close the case. If what we had was representative of normal service at Hinnies then I can scarcely recommend this place highly enough. It makes me wonder what the hell was going on the day I visited Blackfriars – and I have resolved to return there and perhaps set its record straight. Best of all, this hearty and completely comforting meal (from a menu with a substantial choice of offerings) is yours for just £15 at lunchtimes, and between 5 & 7pm except Saturdays. After 7, the full dinner menu looks just as comforting, is chock full of interesting dishes, and still quite reasonably priced. That’s why, as we left, the restaurant was busying up with families, couples and a few tables for whom this was clearly the opening gambit of a long and determined night. 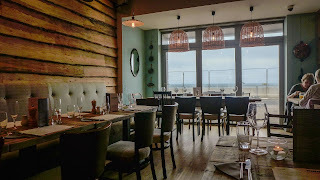 This is a cracking local restaurant and Whitley Bay is lucky to have it. I commend it to you without hesitation. Now, please will you lay off the snarky comments for a bit?